I have a large, happy family that loves to commemorate every occasion with over-the-top celebrations. When I got engaged, my aunts offered to host many events…some of which I’d never heard of. Maybe, like me, you’re clueless when it comes to your own wedding festivities. 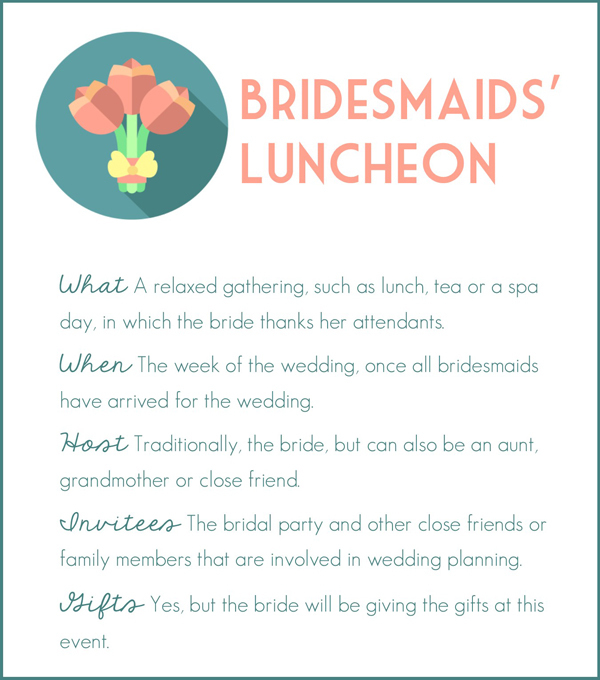 Or maybe, you’ve been invited to a bridal luncheon or rehearsal dinner and you’re wondering what you’re getting into or if you should bring a gift. Either way, we’ve got you covered with this comprehensive guide to wedding festivities. An engagement party is a wonderful way to toast the newly engaged couple, as well as introduce the bride and groom’s family to each other. 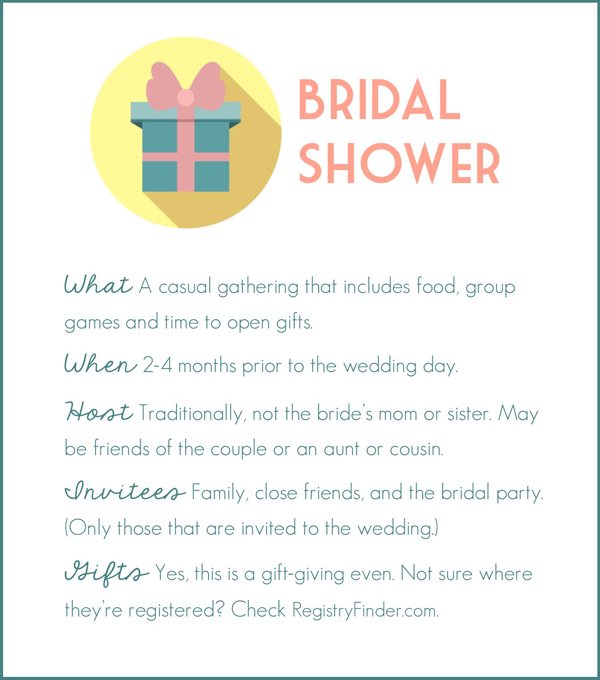 Traditionally, a bridal shower was a ladies-only event in which the guests “showered” the bride with gifts for her new home. Today, coed showers are becoming very popular as many grooms are choosing to be more involved in wedding planning. 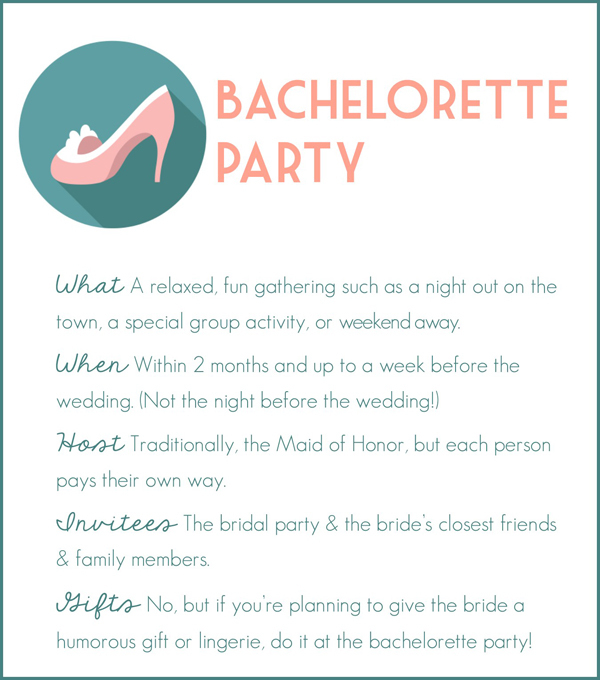 The bachelorette party is one last celebration of the bride’s days as a single woman. It’s typically a smaller gathering that includes only the bride’s closest pals. Is there some confusion amongst the ‘maids? We’ll help you out: Who Pays for the Bachelorette Party? A special gathering, often hosted by the bride, to honor her attendants and any others that have played a special role in planning the wedding day. 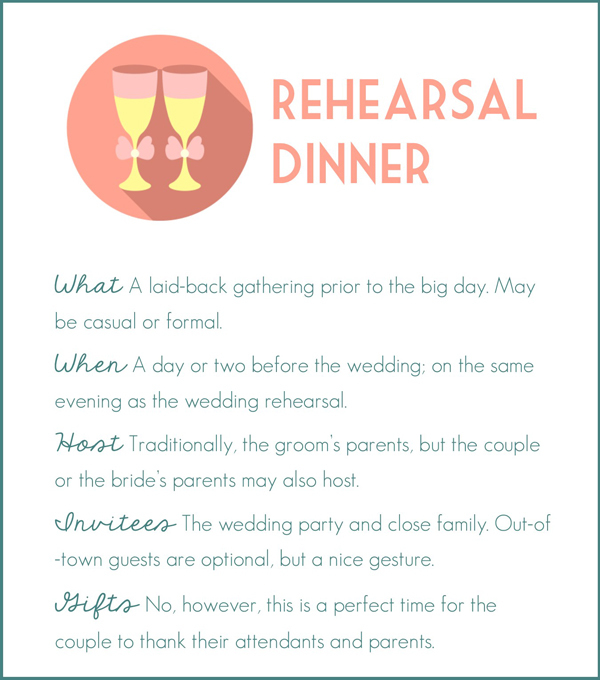 A rehearsal dinner is a perfect time to bring two families together in a relaxed, personal setting before the big day. This celebration of the soon-to-be married couple includes the wedding party, close family and occasionally, out of town guests. The BIG day. Need I say more? Attending a Wedding? 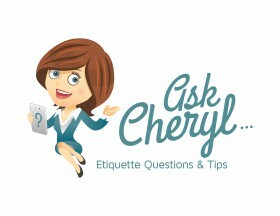 Check these out: Wedding Guest Etiquette | How Much Should I Spend on a Wedding Gift? 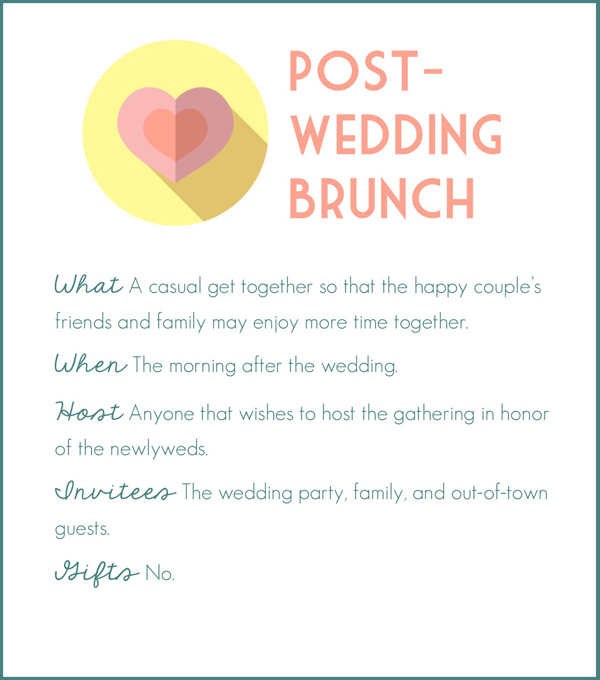 This day-after gathering is one last wedding event and an opportunity for family and friends (and especially out-of-town guests) to rehash the big day and spend a little more time together. If you are hosting one of these events, please be sure that the guests are definitely invited to the wedding. You wouldn’t want to invite someone to the bridal shower who is not also invited to the wedding. The only exception to this rule is at a workplace bridal shower. 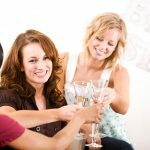 Depending on how close they are to the engaged couple, co-workers may host/attend a workplace bridal shower without being invited to the wedding. Cheryl goes into more details here. You want to be sure that the bridal shower or wedding present you select is something that the newlyweds would like in their home. So, when it comes to purchasing a gift, our suggestion would always be to shop from the couple’s gift registries- even if you think the items they chose may be silly or something you wouldn’t typically select on your own. 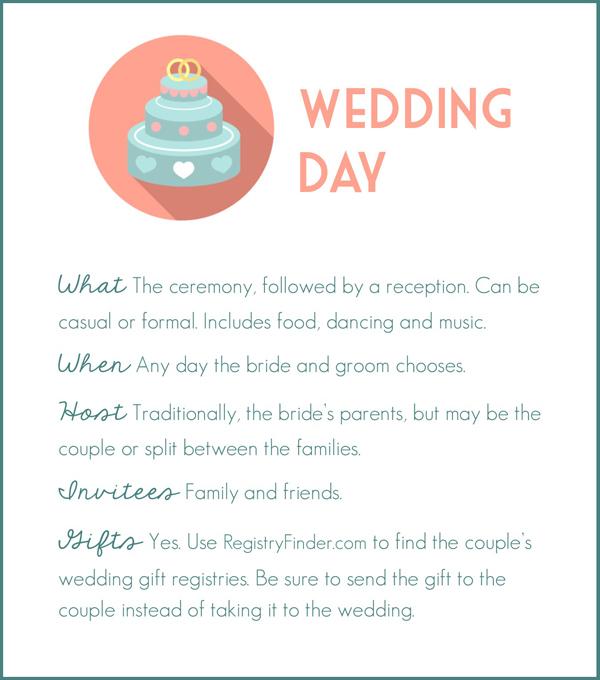 If you’re not sure where the couple is registered, head over to RegistryFinder.com, where you can find all of a couple’s gift registries, purchase a gift and have it sent to their home…in just a few minutes! 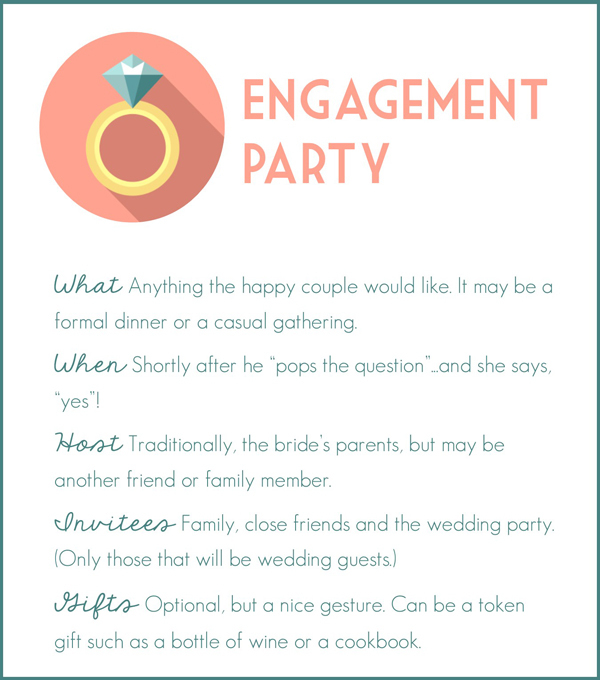 Whether you are the event host, bride-to-be or a guest at one of these lovely wedding celebrations, we hope that this guide has been helpful. Have fun, enjoy the party and always keep in mind that you’re gathering together to celebrate the happy couple! Click the image below to open in a new window, or pin now and read later. 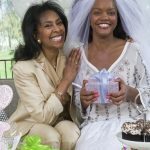 -Written by RegistryFinder.com contributor Rebecca Haar, who has been married for 10 years and has attended countless wedding celebrations since her own festivities.